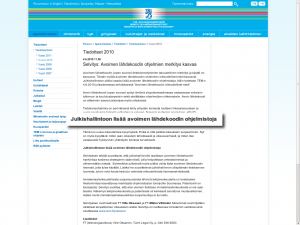 In May 2012 I (Otto Kekäläinen) attended an internal event by the Ministry of Employment and Economy that was intended for officials working within the branch. There where two outsider speakers, and the second was Pasi Mäkinen of Microsoft Finland. In my presentation (in Finnish, available at Slideshare.net) I at first showed the definition of open source and some examples of open source used successfully as part of web services (Google, Twitter, Facebook) and even at some non-obivious places (Apple, former Microsoft owned Codeplex, current Microsoft owned Skype and at Azure, the Microsoft cloud). One facinating example was that after the purchase of Skype, Microsoft installed 10 000 Linux servers to the Skype network to improve it’s performance, and that Linux was the only technology that could fit the task. This and in addition some other statistics helped to prove the point, that open source is wide spread, accepted and often superior technology. Not at all something that one should be afraid to use. As the public consisted of officials, I continued my presentation showing them some specific examples of open source used in public IT-systems and how the procurement notices where written to demand open source from suppliers. It was also inspiring to note that all successful public sector IT-systems that have been successes, are based on Linux servers and other open source technology, while all the huge failures that have cached the headlines are all closed source systems, with typical cloused source symptoms (high cost, low quality, supplier side monopoly). In my presentation I also wanted to stress the fundamental importance that open source really has for Finland. 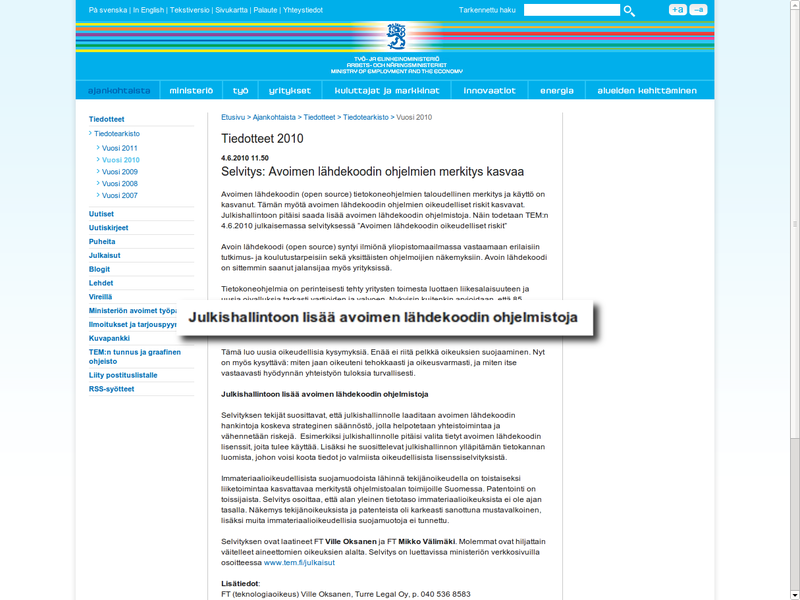 The high profile country brand report note open source as a national trait and strenght of Finland. As the proportion of old people to the tax paying working force rices, we must as a nation deploy more and more automation to manage public services, and it is critical for that automation to be based on open source software so that cost and quality can be controlled by the buyer. Finland would be doomed if such central public sector capabilities would be in the hands of money extorting closed source companies. I also showed that in a report publised by the ministry itself, open source is recommended due to it’s ability to benefit local economy and employment. Indeed, as I also showed on a slide, for example most of the license fees the public sector pays to Microsoft leaves Finland withouth even passing Microsoft Finland Oy, and probably also goes onwards from Microsoft Ireland with minimal taxes, employment or other economical benefits to Finland or the whole of EU. At last I refer to a few public sector issued documents, recommendations and portals that officials can consult to find information how to maximize the usage of open source while designing and procuring new IT-systems. I also stressed the importance of using open standards if a full open source stack is not possible. The presentation that followed by Pasi Mäkinen of Microsoft Finland also stressed the importance of standards, and showed how well Microsoft is represented at hundreds of standards bodies and working groups. At no point did Pasi attack open source or present any of the typical Microsoft FUD regarding security, quality or total cost of ownership. On the contrary, many of his sentenced started with ”As Otto just showed, Microsoft nowadays..” and we had a plesant private discussion afterwards, even though we represent opposite views. Of course, despite the effort to show that the new Microsoft embraces standards and is as open and interoperable as it can, this is still just propaganda, but it is much better propaganda than the old FUD that Microsoft got famous for previously. Also, if they go around promising that they follow standards and are interoperable, at some point they will have to give in and actually do that. An example would be to make a version of MS Office that has the capability to save documents in a ISO-standardized format, or to publish a version of MS Exchange that has proper IMAP support. Some might be fooled by their standards talk and stay on the Microsoft band wagon longer with the delusion that what their data or systems would not be at the lock-in mercy of Microsoft, but at least people would have to make some effort to actually evaluate how open something is and what is the degree of lock-in for any solution, and that helps everybody in the long run. Great article, important work, thanks for sharing!